We’ve been enjoying more than a few ice cream cones this month, National Ice Cream Month. But what if you have gluten sensitivities. Where’s your cone? In the shape of waffle/cake cones, their texture is more like the lighter style wafer/cake cones (here’s the difference between the two types). So what’s in a gluten-free cone? Instead of wheat, there’s a mix of potato starch and tapioca starch, plus other ingredients including sugar, salt and vanilla. The gluten-free cones don’t have the flavor of wheat-based cones, but when ice cream is added, you won’t notice the difference—you’ll just enjoy the crunch. 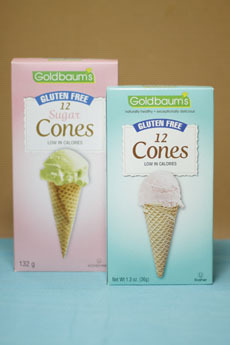 The regular Goldbaum’s cones have just 11 calories apiece, so they’re a boon for calorie counters as well. The sugar cones have 41 calories, are an inch or so taller, and weigh in at 41 calories. Conventional ice cream cones have up to 20% more calories. The line is certified kosher by OU. Find out more at Goldbaums.com. Gluten-free fun. Photo by Elvira Kalviste | THE NIBBLE. Ice cream was invented many centuries before the ice cream cone. Check out the history of ice cream cones.